Download "So Reliable, They re. 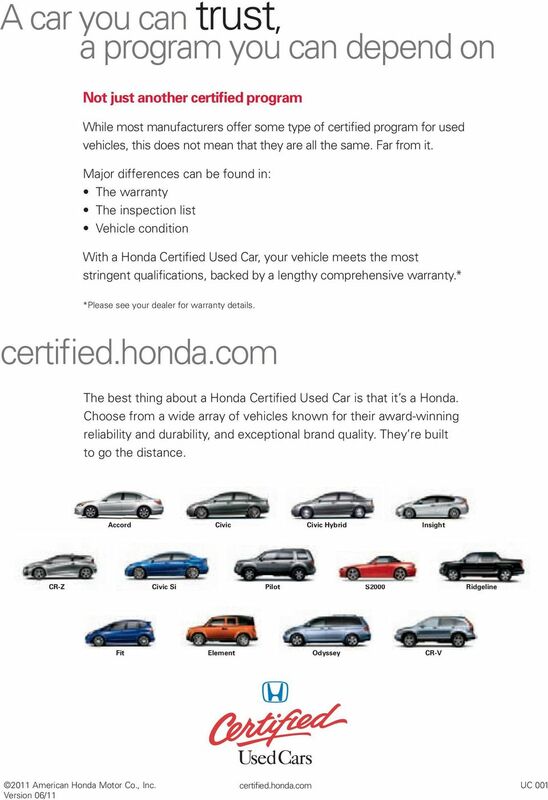 Certifiable"
3 The Warranty Take delivery with peace of mind Your Honda Certified Used Car is backed by one of the most extensive used-car warranties in the business. Powertrain Coverage New Car Limited Warranty 5 years/70,000 mi. 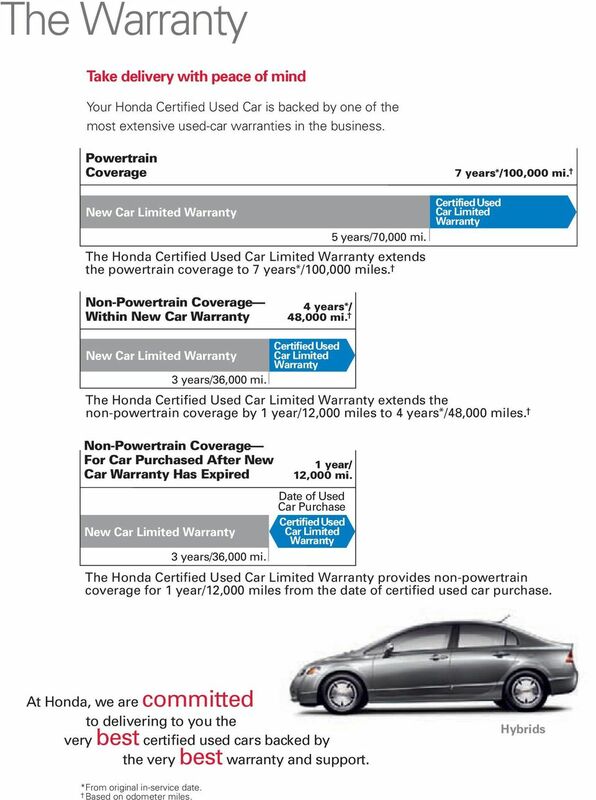 The Honda Certified Used Car Limited Warranty extends the powertrain coverage to 7 years*/100,000 miles. 7 years*/100,000 mi. Certified Used Car Limited Warranty Non-Powertrain Coverage Within New Car Warranty 4 years*/ 48,000 mi. New Car Limited Warranty 3 years/36,000 mi. The Honda Certified Used Car Limited Warranty extends the non-powertrain coverage by 1 year/12,000 miles to 4 years*/48,000 miles. Non-Powertrain Coverage For Car Purchased After New Car Warranty Has Expired New Car Limited Warranty 3 years/36,000 mi. Certified Used Car Limited Warranty 1 year/ 12,000 mi. Date of Used Car Purchase Certified Used Car Limited Warranty The Honda Certified Used Car Limited Warranty provides non-powertrain coverage for 1 year/12,000 miles from the date of certified used car purchase. At Honda, we are committed to delivering to you the very best certified used cars backed by the very best warranty and support. Hybrids *From original in-service date. Based on odometer miles. 4 Key provisions: Powertrain Systems and Components Coverage: Up to 7 years or 100,000 miles from the date the vehicle was first registered under the Honda New Car Limited Warranty. Non-Powertrain Systems and Components Coverage: For 12 months or 12,000 miles beyond the expiration date of the standard new-car warranty (except normal wear and tear, paint and upholstery). Deductible: No deductible on covered repairs made at any Honda dealer nationwide. Transferable: Yes, between private parties. 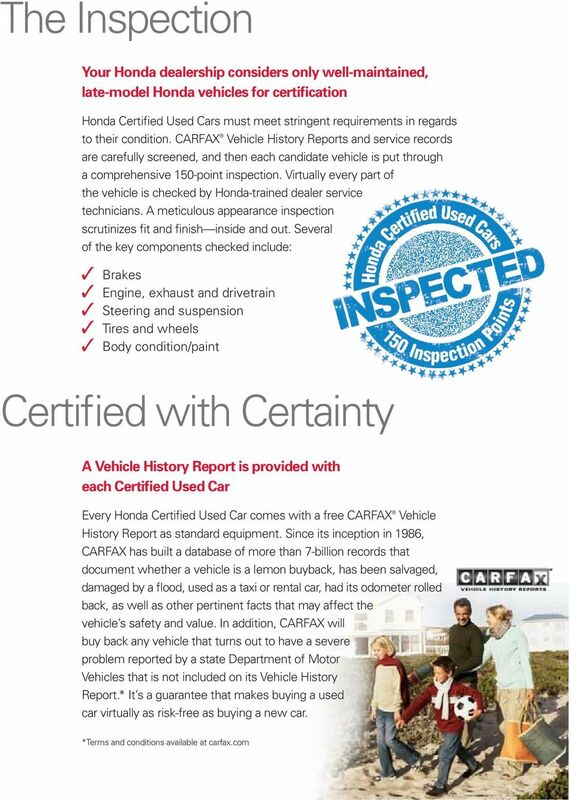 For complete details, ask your Honda dealer to review the Honda Certified Used Car Warranty with you. 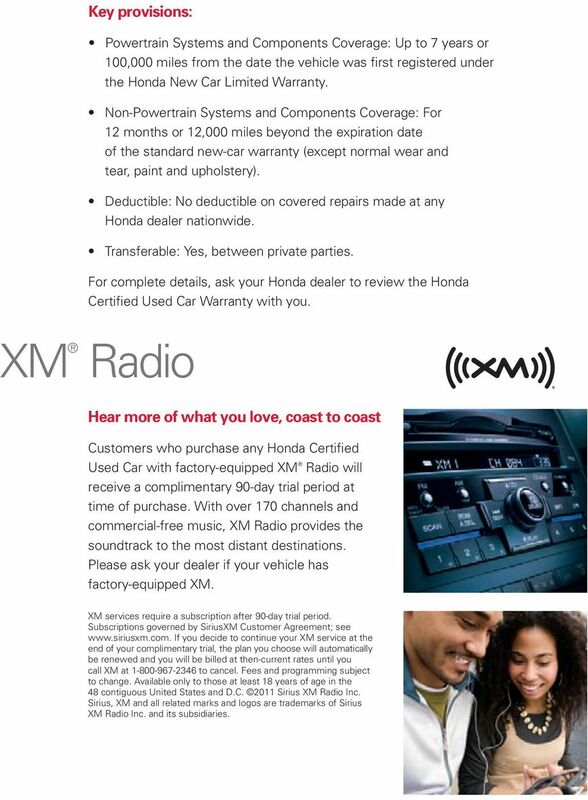 XM Radio Hear more of what you love, coast to coast Customers who purchase any Honda Certified Used Car with factory-equipped XM Radio will receive a complimentary 90-day trial period at time of purchase. With over 170 channels and commercial-free music, XM Radio provides the soundtrack to the most distant destinations. Please ask your dealer if your vehicle has factory-equipped XM. XM services require a subscription after 90-day trial period. Subscriptions governed by SiriusXM Customer Agreement; see If you decide to continue your XM service at the end of your complimentary trial, the plan you choose will automatically be renewed and you will be billed at then-current rates until you call XM at to cancel. Fees and programming subject to change. Available only to those at least 18 years of age in the 48 contiguous United States and D.C Sirius XM Radio Inc. Sirius, XM and all related marks and logos are trademarks of Sirius XM Radio Inc. and its subsidiaries. 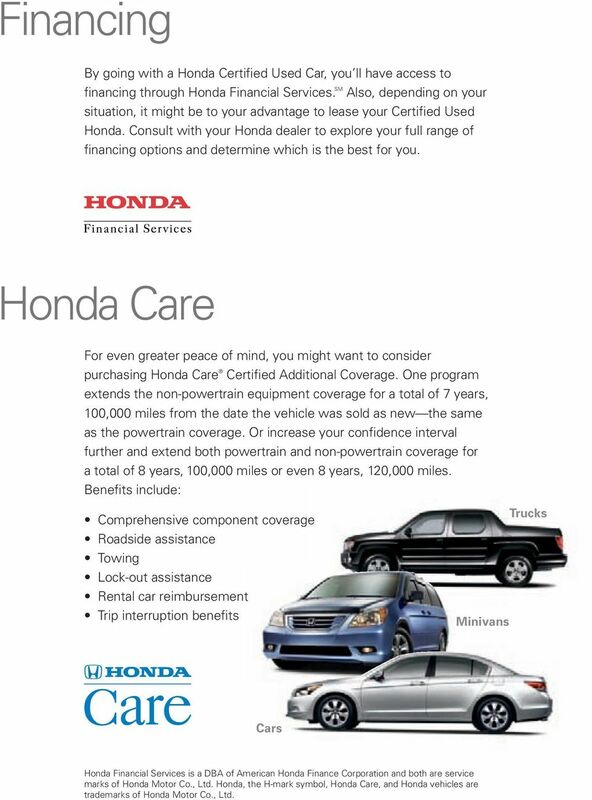 5 Financing By going with a Honda Certified Used Car, you ll have access to financing through Honda Financial Services. SM Also, depending on your situation, it might be to your advantage to lease your Certified Used Honda. 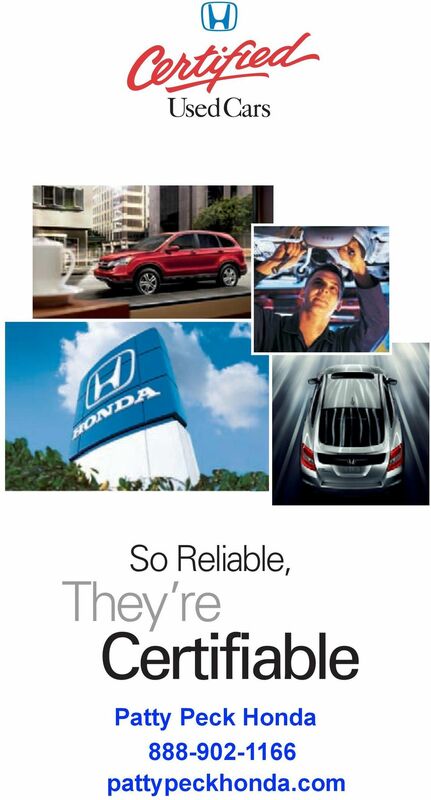 Consult with your Honda dealer to explore your full range of financing options and determine which is the best for you. Honda Care For even greater peace of mind, you might want to consider purchasing Honda Care Certified Additional Coverage. One program extends the non-powertrain equipment coverage for a total of 7 years, 100,000 miles from the date the vehicle was sold as new the same as the powertrain coverage. Or increase your confidence interval further and extend both powertrain and non-powertrain coverage for a total of 8 years, 100,000 miles or even 8 years, 120,000 miles. Benefits include: Comprehensive component coverage Roadside assistance Towing Lock-out assistance Rental car reimbursement Trip interruption benefits Minivans Trucks Cars Honda Financial Services is a DBA of American Honda Finance Corporation and both are service marks of Honda Motor Co., Ltd. Honda, the H-mark symbol, Honda Care, and Honda vehicles are trademarks of Honda Motor Co., Ltd.
F. Schedule of Covered Autos (Dealers only) List any owned tow truck, car hauler, or service vehicle to be insured. GARAGE APPLICATION General Information Effective Date: 1. Your Name Phone No. (dba) 2. Mailing Address 3. Your Web site address 4. Location #1 Address 5. Location #2 Address Is there work done elsewhere?